The Elixir restores and heals damaged skin tissue and restores skins natural defenses. The unique combination of southern exotic wildlife gardens: sesame, coconut and macadamia oils enriches the skin with pro-vitamin concentrate and Silbiol. The elixir restores and maintains water balance in dry skin, relieves irritation, itching, redness and skin peeling. Actively promotes the healing processes in the skin after burns, bedsores and other skin disorders - eczema, psoriasis and more. The elixir contains Silbiol - a natural, ecologically pure product, which is abundant in micro - and macro elements, essential oils, vitamins and a source of natural hormones. The basic raw material for the extract is obtained from the spruce and pine tree needles. This phytoncide andmultivitamin extract acts as a powerful anti-microbial, anti-inflammatory, wound healing agent, with deodorising properties due to chlorophyll, phytosterol and phytoncide presence. Macadamia Oil – a natural antioxidant, elasticises, softens, prevents premature aging, and keratosis. Sesame oil - moisturizes, nourishes, cleanses the skin (removes metabolic waste products), has anti-inflammatory effect, and acts as a UV filter. Sesame seeds contain phytosterol, sesamin, sesamolin, Vitamin Е, fatty oils (up to 60%), which contains the following acids: oleic, linoleic, palmitic, stearic, arachin and lignocerin. Vitamin Е (9% of RDA), vitamin K (13% of RDA), saturated fatty acids (up to 14%), polyunsaturated omega fatty acids complex (up to 41%), natural antioxidants (sesamol). Grape seed oil - antioxidant, prevents aging of the skin, penetrates deeply into the skin and nourishes it, great moisturizer for dry skin, contains more lanolin acid than other essential oils and is easily absorbed into the skin without greasy feel. Contains Vitamins: A, B, C and E. The Grape seed Oil soothes, moisturizes and protects, especially sensitive and dry skin, restores elasticity and smoothes out wrinkles. Promotes skin cell metabolism.Suitable for all skin types, especially effective for oily skin. Anti-inflammatory, regenerating effect, improves skin elasticity, prevents wrinkles, hydrates, softens, tones and refreshes. Effective in treating abrasions, increases décolleté skin elasticity and tone, helps in fighting cellulite. Coconut Oil - protects, softens, moisturizes, nourishes, and has anti-inflammatory properties. Promotes intensive skin rejuvenation, making it velvety smooth and soft.Perfect for smoothing out fine lines, improves skin colour, making it radiant all day long. Rapeseed Oil - contains vitamin E, which protects the skin against oxidative damage at the protein and DNA cell level, as well as provitamin A (Beta-carotene), and Omega 3, Omega 6, Omega12. Vitamin E is a classic antioxidant (a substance that can reduce, delay or prevent oxidisation of other substances), which protects the skin from free radicals, protects and prevents skin from aging, reduces skin dehydration and improves its natural defence abilities. Vitamin E is a natural preservative for oil, especially crude –a supplement of 0.5% of the total masswill extend its shelf life and prevent it from oxidation. A small amount of vitamin E enriches skin care with moisturizing and skin softening qualities, protects against harmful UV exposure, promotes cell renewal and protects skin against the harmful influence of free radicals. Lycopodium Extract - has healing effect on wounds, burns, frostbite, eczema, furuncles, herpes and rosacea inflammation. • For use at home – for better absorption moisten the skin with water and apply a couple of drops of elixir in the morning and evening. The elixir can be used daily instead of day cream. In winter it protects the skin from wind and frost damage. Before going out, apply a thin layer of elixir onto skin. Oily skin type: Apply more water and less of product. Dry skin type: apply more of the product and less water. The elixir emulsifies directly on the skin. 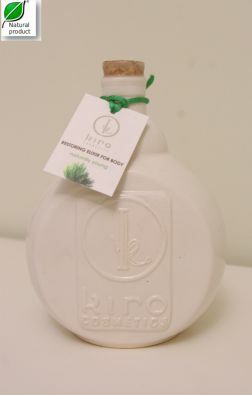 • Natural, 100% BIO SPA product for body. • Product is suitable for all skin types. Suitable for all types of vegetarians. • In the production of the concentrate only virgin oils have been used that allow to retain all the valuable substances in plants and oils. Packaging: 350 ml ceramic bottle (handmade).